We’ve discussed civil asset forfeiture before. This is the practice that allows law enforcement to take your cash, cars, home and any other property away from you if you are suspected of a crime. No conviction is necessary, and you don’t even have to be a drug dealer to be a target. Last month, U.S. Attorney General Jeff Sessions announced his renewed love affair with the “war on drugs.” He seems to specifically be targeting marijuana, which is being made legal in state after state across the country. No matter, Sessions sees it as a huge problem in our country, and he has appointed a task force to review the link between marijuana and violent crime. Never mind that the most violent crime I have ever committed while high on marijuana was against a bag of Trader Joe’s Kettle Corn that I demolished in one sitting (and no, I am not ashamed). Sessions believes that weed—not cocaine, not heroin, not methamphetamine—has a direct link to violence. 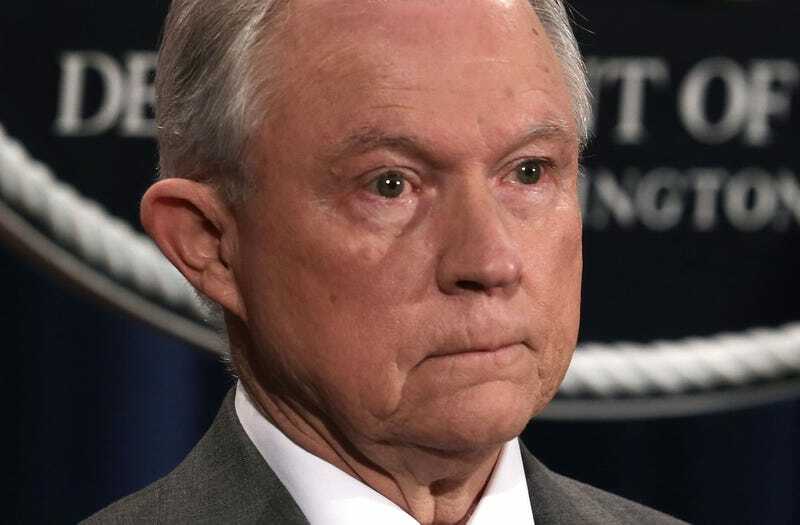 At the same time that Sessions began to target weed, he announced that he was reinstating the adoptive forfeiture program, a program that had previously been abolished by the Obama administration, which allows local law enforcement to circumvent state laws and take the assets and property of people suspected of a crime under more lax federal laws. Under the adoptive forfeiture program, law enforcement agencies that take cash, cars, homes and property from “suspected” criminals get to keep 80 percent of it for themselves as profit, and they hand over 20 percent to the federal government. It is a very lucrative source of income for law enforcement; in the 12 months before then-Attorney General Eric Holder shut down the program in 2015, local authorities took in $65 million, which they shared with the federal government. So if the idea is to defund organized crime, prevent new crimes from being committed, and weaken criminals and cartels, why are we going after low-level marijuana dealers and poor people? As previously reported on The Root, there is evidence that forfeiture efforts tend to target poor neighborhoods, and although defenders of the practice claim that it is necessary to disrupt major criminal organizations, a 2015 report from the Institute for Justice (pdf) showed that between 1997 and 2013, 87 percent of Justice Department forfeitures did not require a criminal charge or conviction. Take, for example, the Las Vegas Metropolitan Police Department. Daniel Honchariw of the Nevada Policy Research Institute recently released a report (pdf) that reviewed the LVMPD’s forfeiture activities for the fiscal year 2016. NPRI analyzed 346 forfeiture cases and, using information provided by the Nevada attorney general and public records requests, found that the Police Department collected $1.9 million via asset forfeiture in 2016. 56 percent involved cash or other assets valued at $1,000 or less. 28 of the cases involved $100 or less. 13 of the cases involved $20 or less. Two cases involved $1 or less. Either these are some pretty cheap cartels and criminal organizations, or what the policy is supposed to do and what is actually happening are two different things. NPRI also found that 66 percent of the forfeitures occurred in the same 12 zip codes in Las Vegas, zip codes in which the neighborhoods consist mainly of minorities and low-income residents. There are 48 zip codes total in Las Vegas. The average poverty rate in the 12 targeted zip codes is 27 percent, compared with the countywide (Clark County) poverty rate of 16 percent. For contrast, the average poverty rate in the other 36 zip codes is 12 percent. NPRI rightly suggests that the practice of forfeiture is regressive in nature and targets the poorest, most racially diverse areas of Clark County, where the individuals lack the knowledge and resources to effectively combat it. NPRI also suggests that the practice be abolished and replaced with one that requires a criminal conviction in all cases. This suggestion is right on. Jeff Sessions isn’t fooling anyone. By going after marijuana, a low-level drug, and people in poor neighborhoods, he is demonstrating his desire to keep his foot on the neck of poor people, black and brown. If the true intention were to go after cartels, we wouldn’t see asset forfeiture in poor neighborhoods, because members of cartels aren’t living there. If the feds were going after cartels, then the NPRI would not be able to show that the lowest-valued asset forfeiture in Las Vegas amounted to just 74 cents. This is your tax dollars at work. The attorney general is not trying to keep you safe; he’s trying to make sure that poor black and brown people continue to lose. Because a majority of forfeitures concern less than $1,000, there is often no practical recourse for the alleged law-breakers. This is so because the cost of hiring an attorney and pursuing formal legal action typically outweighs the value of the seized assets. There is also little chance of finding an attorney who is willing to work on a contingency-fee basis for these types of cases, as the government prevails in the vast majority of forfeiture litigation. Civil asset forfeiture is definitely targeting poor black and brown people. We need to figure out why and put a stop to it.